When it comes to yarn, I’m pretty fickle. 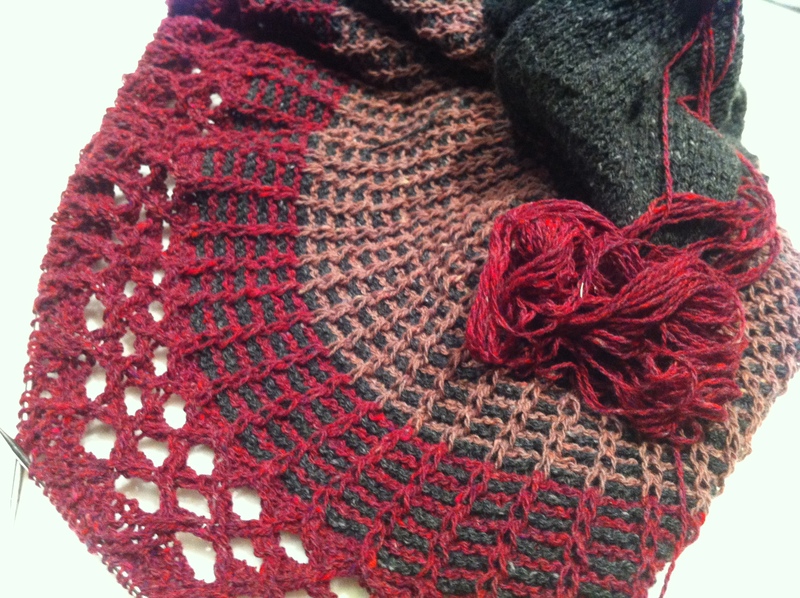 My love for Sanguine Gryphon Gaia Lace has been pretty well documented. I still love it, and happily bring this yarn out of my stash for deserving patterns. 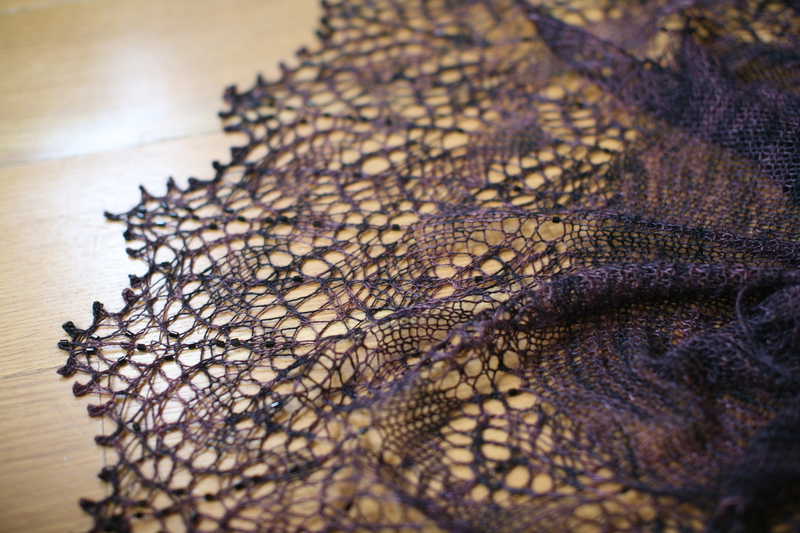 In fact, I recently finished the Romi Hill shawl that I wrote about, in Gaia Lace in Owlets, which is a beautiful silver grey. I was a good girl — only modified the pattern slightly by beading the bind off. I have yet to wear this shawl, since the yarn and the beading combination makes this shawl pretty dressy. My first foray into blogging about knitting was about Wollmeise so my partiality to Claudia’s beautiful colors is also no secret. 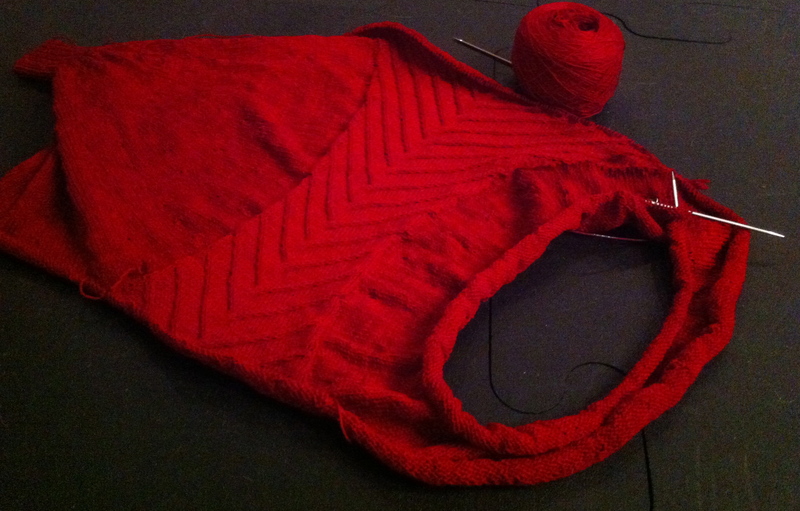 I am about to cast on a project in Lacegarn, which I will talk about at some point…and I have Cookie A’s Conic on my needles right now in 100% Merino in Ruby Thursday, which is a really pretty red. 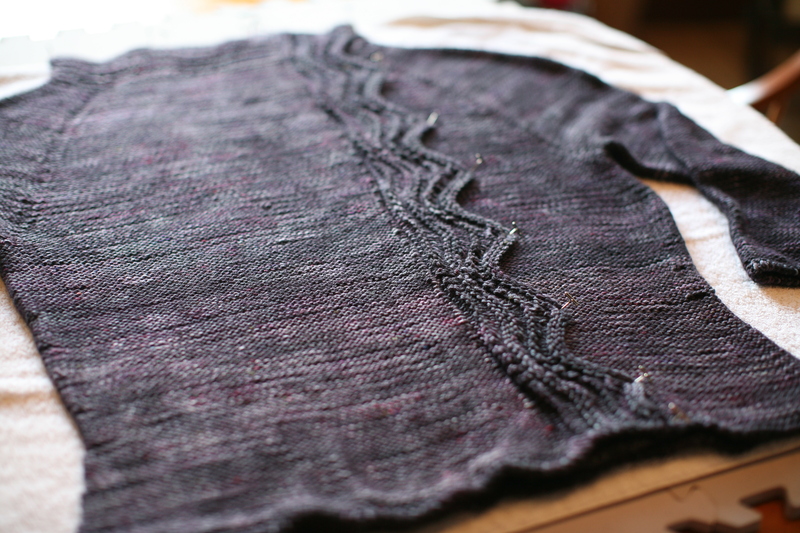 First, the secret test knit I wrote about last time. You can see the shawl all crumpled up in the group photo. It’s BooKnits Almost Autumn. 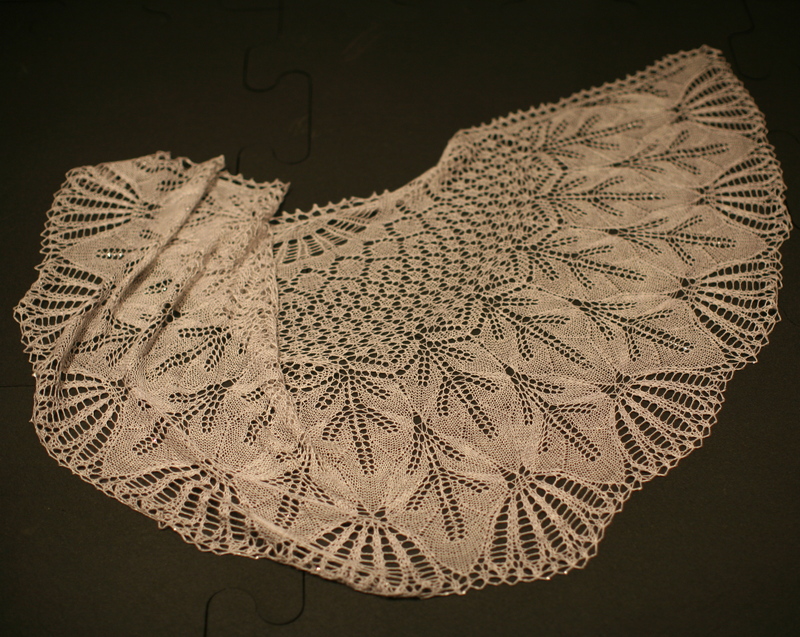 It’s a wonderful pattern, slightly different from Bev’s usual designs and it is lace all over. I made mine out of French Market Fibers Mohair Lace in Spanish Moss. I was a bit of a rogue test knitter (!) and omitted the beads. 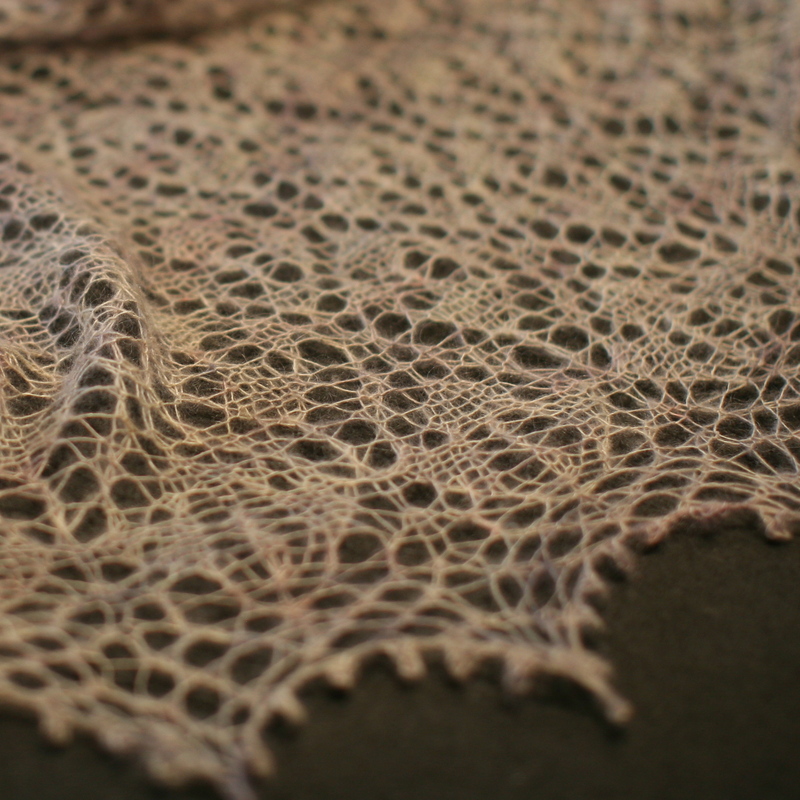 I wanted this shawl to be ethereal and…well.. look like Spanish Moss. The photo doesn’t quite do justice to the beautiful and subtle colors in the yarn (look really closely — there are hints of pink, green, grey…) The shawl is about to board a transatlantic flight, to be worn by a friend at a wedding, in which she is a guest. I hope I get the shawl back! 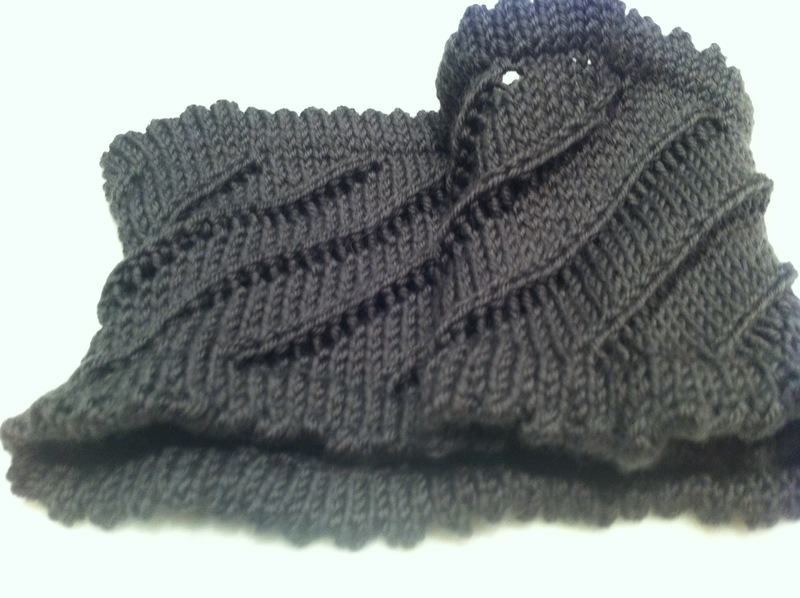 The second project is a sweater that I just finished knitting and is currently being blocked. It’s Levenwick by Gudrun Johnston. It was part of Brooklyntweed’s Wool People I, and has been in my queue since it first came out. I made mine out of French Market Fibers Merino Worsted in Wrought Iron. I cannot wait to get this sweater off the blocking boards. I had originally ordered this yarn from Margaret with thoughts of making something else, but as soon as I opened my package, I knew that it would be perfect for this sweater. The body of the sweater is knit in reverse stockinette — which makes the fabric look woven. It’s really perfect for a subtly variegated yarn, I think. The color is sort of purply and grey and black and lovely. I ran out of yarn so I couldn’t make the pocket for this, but I think it keeps the lines simple and very work worthy. I plan on wearing this with a shawl pin to close at the neck until I see Jennie at Rhinebeck so she can make me the perfect buttons for the sweater. 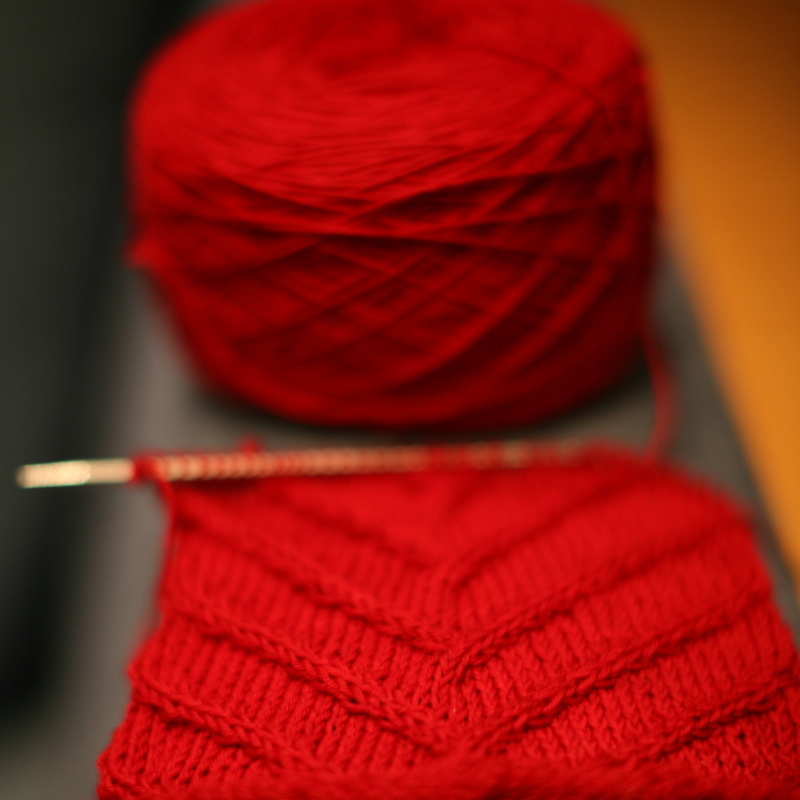 What’s new on your needles, now that the weather is turning a bit more sweater-worthy?